Voting as part of the story marks this as a recent version, and the shrinking forest (possibly an allusion to deforestation) might be recent as well. But the main idea — that the trees accepted the axe because its handle was wood and they thought it was one of them — feels antique, fabulesque. And so it is. The title of The Woodcutter and the Trees covers a complex of fables of Greek and West Asian origin that are ascribed to Aesop. All of them concern the need to be wary of harming oneself through misplaced generosity. In the Greek cultural area, which at one time included all of West Asia, there were three fables dealing with the relations between trees and woodcutters. In one of these, numbered 302 in the Perry Index, the oaks complain about their treatment to Zeus, the king of the gods, who answers that they have only themselves to blame for supplying the wood for their axe staves. Yet another fable of similar meaning is numbered 303 in the Perry Index. In it an oak (or a pine in another version) complains of being split by wedges made from its own branches. Commentaries on these fables point out that suffering is increased by the knowledge that it is one’s own fault, whoever inflicts it; or, as is implied by the Turkish proverb mentioned above, if a group has a problem, its root may be found within itself. In another variant of the theme, a woodman comes into the forest and begs the trees ‘to give him a handle made of the hardest wood. The other trees selected the wood of the wild olive. The man took the handle and fitted it to his axe. Then, without a moment’s hesitation, he began to chop down the trees’ mighty branches and trunks, taking whatever he wanted. The oak tree then said to the ash, ‘It serves us right, since we gave our enemy the handle he asked for!’ This text comes from the Mediaeval Latin fable collection of Ademar of Chabannes, who comments upon it, ‘You should think twice before offering anything to your enemies’ (Ut cogites ante ne hosti aliqua praestes). This version was taken up early by the Anglo-French poet Marie de France and was also preferred by 15th century collectors of fables in European vernaculars like Heinrich Steinhowel and William Caxton. During Renaissance times it was made the subject of poems by the German Neo-Latinists Hieronymus Osius and Pantaleon Candidus. Jean de la Fontaine also made it the subject of his La forêt et le bûcheron (Fables X11.16), translated by Elizur Wright as “The Woods and the Woodman”. In his telling, the woodman breaks his promise to work further off and not harm his benefactors. A version based on this was set for accompanied children’s voices by the composer Rudolf Schmidt-Wunstorf (b. 1916). In the Bengali collection, the poem was titled “Politics”, and with this clue the reader was expected to interpret the fable in the context of the time as a parable of the imperial stripping of Indian resources. Rush was a Canadian rock band [recently disbanded] comprising Geddy Lee (bass, vocals, keyboards), Alex Lifeson (guitars), and Neil Peart (drums, percussion, lyrics). Formed in 1968, the band went through several configurations until arriving at its longest and most popular line-up when Peart replaced original drummer John Rutsey in July 1974, two weeks before the group’s first United States tour. Rush is known for its musicianship, complex compositions, and eclectic lyrical motifs drawing heavily on science fiction, fantasy, and philosophy. The band’s musical style has changed several times over the years, from a blues-inspired hard rock beginning, later moving into progressive rock, and including a period marked by heavy use of synthesizers. In the early 1990s, Rush returned to a guitar-driven hard rock sound, which continued for the rest of their career. Back to the fables of the trees. The core of the history is relatively clear (though there are a number of woodcutter/tree fables; it’s not one proto-fable, with variants, but a loosely related family of fables), but there are puzzles at both ends: the immediate source of the text in #1 (with the shrinking forest and the voting), and the history of the (old) “Turkish proverb” sometimes said to be its precursor. What we need is some evidence of an actual old Turkish proverb. Or story or wry joke or whatever. 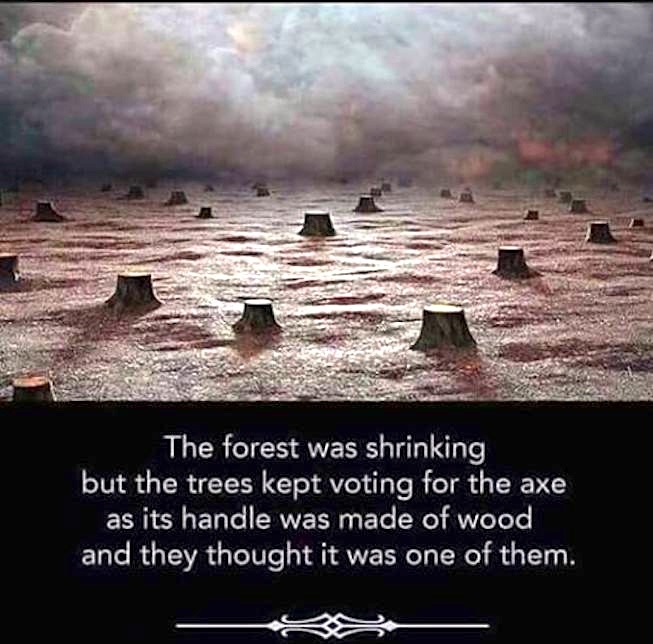 Not just George Danns’s 1982 attribution of ‘When the axe came into the Forest, the trees said “The handle is one of us”‘ to a “Turkish proverb”. This entry was posted on October 15, 2018 at 6:28 am and is filed under Formulaic language, Music, Poetic form, Poetry, Slogans. You can follow any responses to this entry through the RSS 2.0 feed. You can leave a response, or trackback from your own site.